My Penang Bridge International Marathon 2018 [HM] (review by Lingderella) | JustRunLah! Grab was just damn cheap so we travelled around by Grab. Flag off was at 3am near Queensbay Mall which was far away from the hotel we stayed. According to Google Maps, it’s about 25 minutes drive away. Eleanor and I decided on waking up at 1.45am as we were already in our running attire when we went to sleep, so once we woke up and slot in our shoes, we were ready to go. 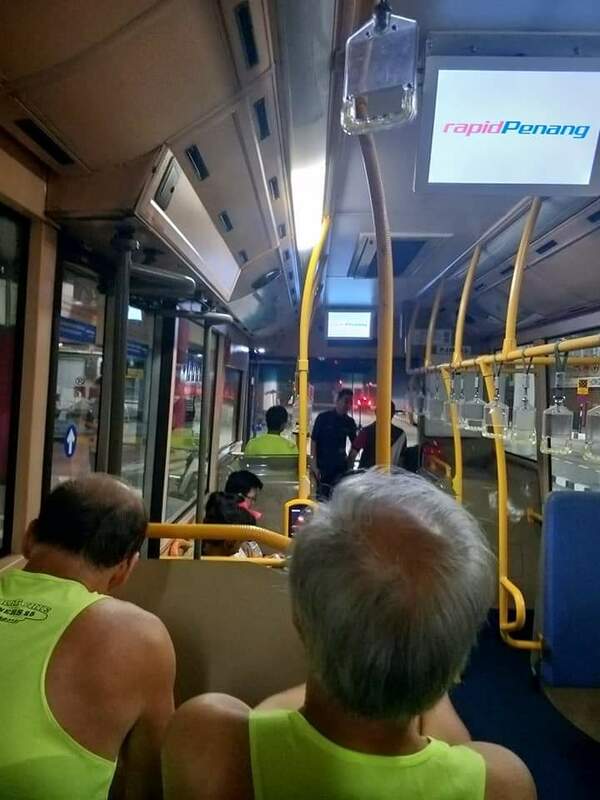 Grab arrived within minutes but the Grab driver told us to cancel the booking and go Komtar by taking the shuttle bus to race site instead as there was plenty of road blocks and it’s difficult to maneuver around. 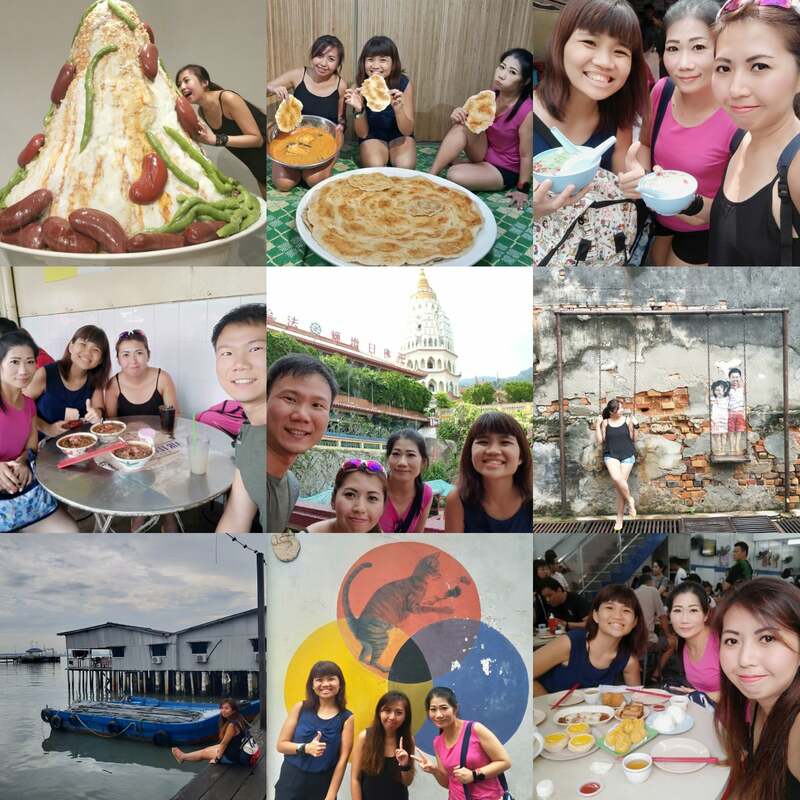 The Grab driver didn’t want to earn my RM15 😂 Sibeh heng part was Komtar is just right beside the hotel, we walk there and paid RM2 each for the shuttle bus. Cheap Cheap 😍 Singapore’s shuttle bus to races cost about SGD6 at least. Flagged off was punctual at 3am as a little while after, the elite runners flew past us already in the opposite direction of us walking towards to. It’s a single wave flag off. By the time I started my Garmin and ready to run, it’s 3.10am. I really clap clap clap for some runners, it’s just at the beginning of the run they were walking 😱 Hope they completed within the cut off time of 3 hours and 45 minutes and get their finisher entitlements. As I’ve read in the official PBIM Facebook posts comments that some runners did not get their finisher medals but I guess high chance it’s because they didn’t finish within the cut off time. Can’t remember since when, there’s some slight drizzle. 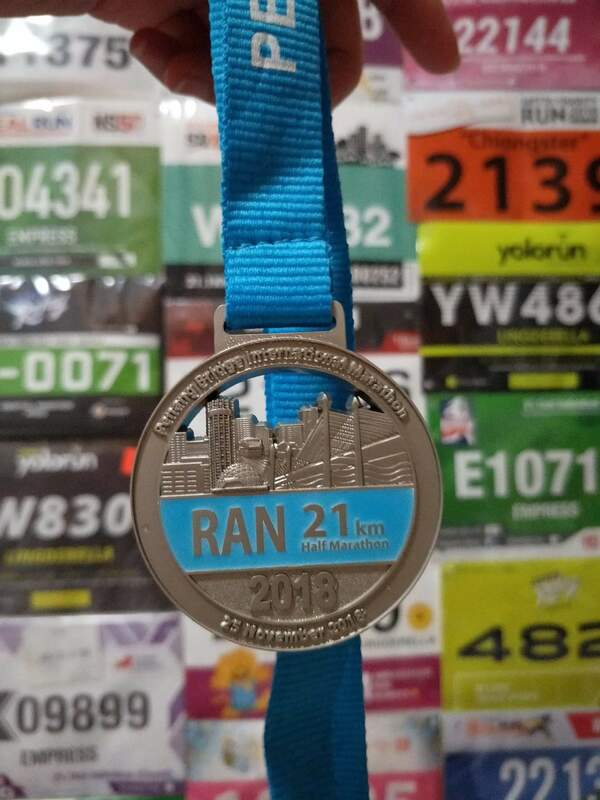 I thought the race was cancelled and cut short as its only about 11km or what on my Garmin when the distance marker showed 15km, now I guess it’s because they were for full marathoners only. I think it’s the only distance board I ever saw till I saw the last km board at the last km. It’s a international run and distance boards should be more prominent and be place at every km. Even if the organizer cancelled the run, we wouldn’t have any place to go as well because it’s on the expressway. I guess it’s almost 19km of expressway and bridge, not much of a scenery as its dark and then the thunderstorm 😆 If flag off would be much later we may get to catch some scenery. Soon enough, it rained heavily. 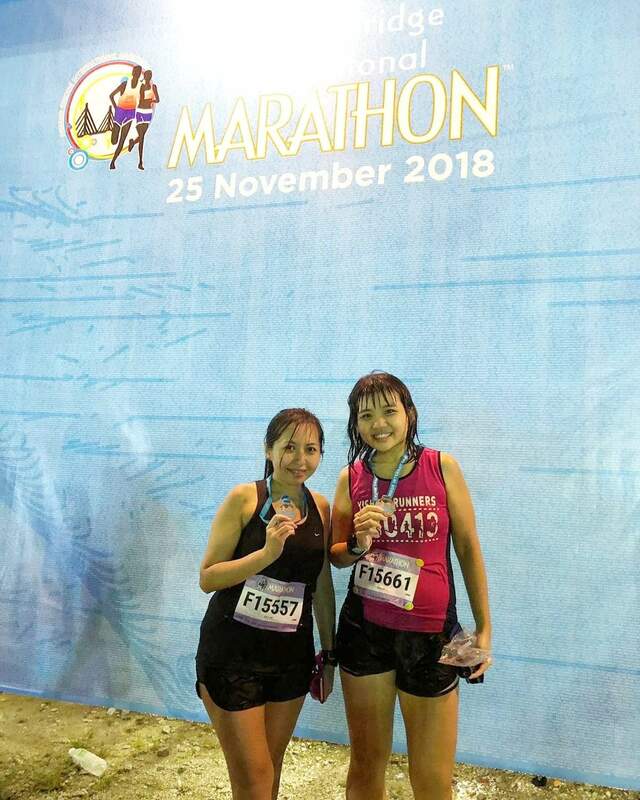 My eyes cant open and I blinked like 200 times per minute 😂 And when I got to a hydration point, I thought ponchos were given out to runners in the event of rain and was impressed a while but it’s just that I think too much already, those were not ponchos but trash bags 😂 When I realised its trash bag, I tore 3 holes and slot my head and arms through. Come, I clap for myself 😆 Though I thought of throwing it away since I’m all wet already and the poncho was making pretty annoying noises but I was using it to keep me a little warmer and praying that my phone will not get spoiled because of the thunderstorm. Luckily at the end of the run my phone’s still working. Some cute ones even took out their phones in this crazy weather and take videos and photos, maybe it’s waterproof phones. I drank a lot of rain water and skipped a hydration point as I thought it’s no difference to drink from hydration point since it would be rain water as well. Then I stopped drinking the rain water and wonder of pollution and falling sick. But it’s OK runners, Google states that most rain waters are safe to drink and the pollutants it contains might even be lesser than the public drinking water supply 😆 When I got to the next hydration point, after u turn on the Penang bridge, I must really say the volunteers there were super excellent, they covered the water in the cups with their hands and pass us the water ❤ Thank you volunteers, deeply appreciate them to still be around in such weather conditions volunteering and cheering for runners. I walked a lot since it started raining heavily. Many people walked as well and some even seek shelter under the bridge. 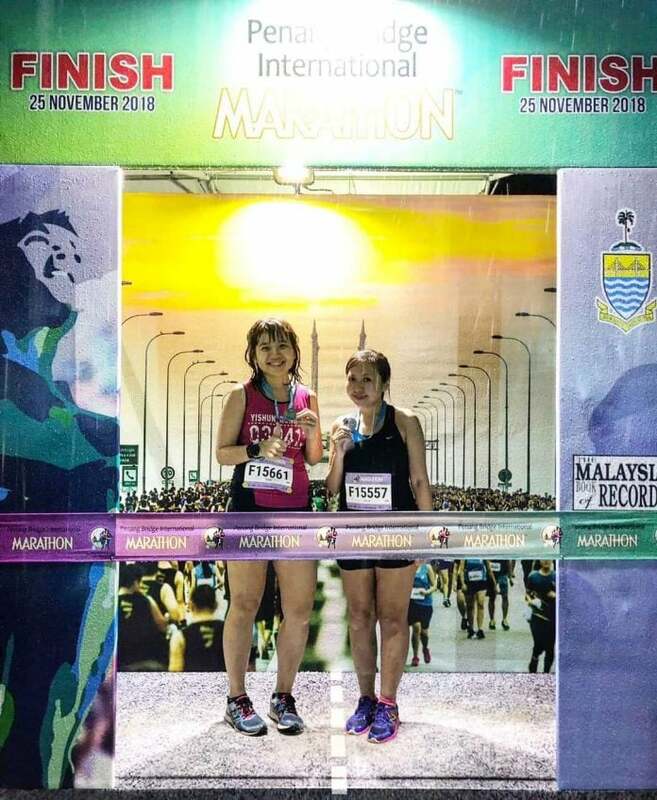 But time still continues, cut off time for half marathon will still remain at 3hrs45mins and not magically increase. 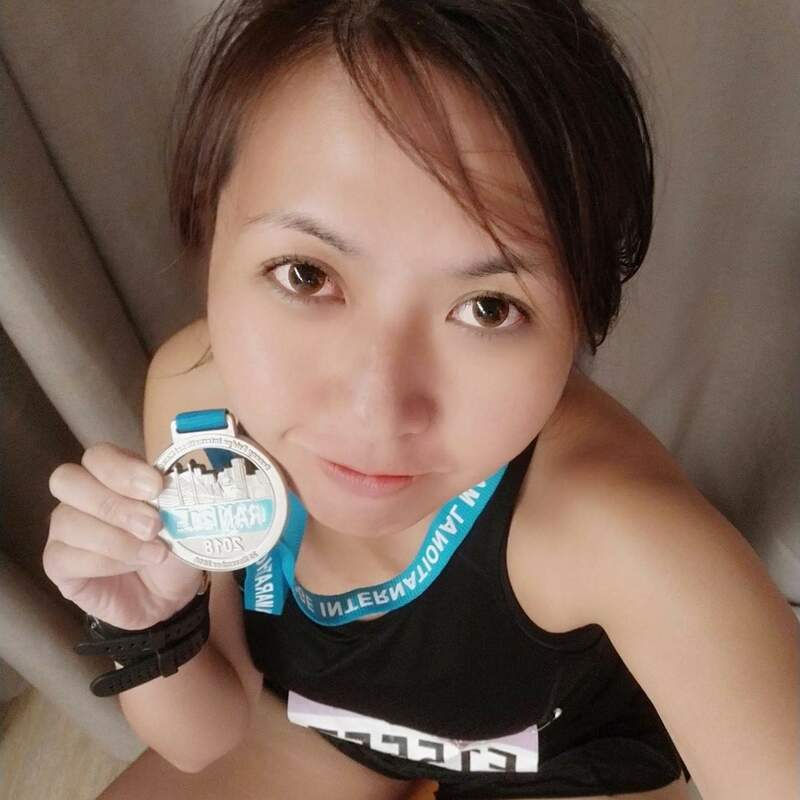 I can still run, but I’m just not motivated to because I feel the abrasions in both my thighs 😭 I’m actually pretty amazed I still end up in the top 15 percent of my category which showed at least maybe I did put in some effort to run 😆 When I was first start walking, I started a conversation with a men walking next to me, turns out he’s also from Singapore and this was his 6th PBIM, he said this was by far the worst weather condition and such runs won’t be cancelled as long as flagged off. It’s only at the last km I realised that the thunderstorm became a drizzle. 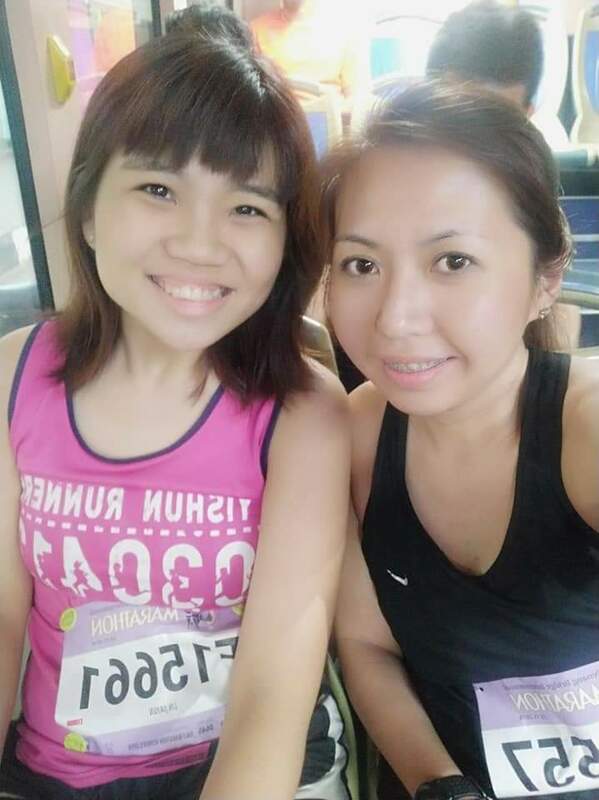 When we finished the run, the only thing we got is the finisher medal and a lucky draw coupon. I queued for the Milo in the rain and shortly found Eleanor in the shelter out of the people mountain people sea without the help of communicating through the phone. I only realised how cold it was when I remove the trash bag to take photos 😂 The thrash bag really was a life saver! And I didn’t fall sick after that like I thought I would. We left shortly after some photos walking back to shuttle bus drop off point. We saw the 10km runners coming back from their start point at the other side. Their run was cancelled. Felt bad for them, they made the effort to turn up in this thunderstorm morning with a perfect weather to stay in bed and yet the run was cancelled and to proceed to collect a meaninglrss medal that they didn’t earn and sweat for. Though at that point of time and after the thunderstorm that the half marathon and full marathon runners been through, I felt that the weather was perfectly fine to go ahead with the 10km run. There’s still many aspects of the run that the organisers could do to improve the running experience of the runners. For me, this event was fine but I’ve read many negative feedback from PBIM’s official Facebook page. 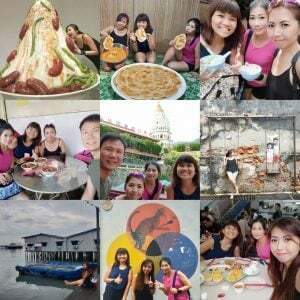 I wouldn’t be back to PBIM any years soon as there’s still many other place I would like to go and have my runcation and explore.